The Golden Age of Radio Shack was probably sometime in the mid-1970s, a time when you could just pop into the local store and pay 49 cents for the resistors you needed to complete a project. Radio Shack was the place to go for everything from hi-fi systems to CB radios, and for many of us, being inside one was very much a kid in a candy store scenario. That’s not to say that Radio Shack was perfect, but one thing it did very well was the education and grooming of the next generation of electronics hobbyists, primarily through their “Science Fair” brand. Some of us will recall the P-Box kits from that line, complete projects with all the parts and instructions in a plastic box with a perfboard top. These kits were endlessly entertaining and educational, and now [NetZener] has recreated the classic neon “Goofy Light” P-Box project. As it was back in the day, the Goofy Light is almost entirely useless except for learning about DC-DC converters, multivibrators, RC timing circuits, and the weird world of negative resistance. But by using the original Science Fair instructions, compiling a BOM that can be filled from Mouser or Digikey, and making up a reasonable facsimile of the original P-Box chassis, [NetZener] has done a service to anyone looking for a little dose of nostalgia. It would be interesting if someone brought back the P-Box experience as a commercial venture, offering a range of kits with circuits like the originals. If that happens, maybe some of the offerings will be based on that other classic from Radio Shack’s heyday. The world runs on marketing hype. Remember the public relations swirl around the Segway? Before it rolled out we were led to believe it was going to be remembered as fire, the wheel, and Segway. Didn’t really happen. Microsoft and IBM had done something similar with OS/2, which you may not even remember as the once heir-apparent to MS-DOS. OS/2 was to be the operating system that would cure all the problems with MS-DOS just as IBM’s new Microchannel Architecture would cure all the problems surrounding the ISA bus (primarily that they couldn’t stop people from cloning it). What happened? OS/2 died a slow agonizing death after the Microsoft/IBM divorce. But for whatever reason [Ryan C. Gordon] decided to write a Linux emulation layer for OS/2 call 2ine (twine). We like retrocomputing projects even if they aren’t very practical, and this one qualifies. The best analog for 2ine is it is Wine for OS/2, which probably has something to do with the choice of name. You might be ready to click away since you probably don’t have any OS/2 programs you want to run, but wait! The good news is that the post has a lot of technical detail about how Linux and OS/2 programs load and execute. For that reason alone, the post is well worth a read. There was a time when USB to serial hardware meant one company: FTDI. But today there are quite a few to choose from and one of the most common ones is the WCH CH341. There’s been support for these chips in Linux for a while, but only for use as a communication port. The device actually has RS232, I2C, SPI, and 8 general purpose I/O (GPIO) pins. [ZooBaB] took an out-of-tree driver that exposes the GPIO, and got it working with some frightening-looking CH341 boards. He had to make a slight mod to the driver to get six GPIOs in /sys/class/gpio. Once there though, it is easy to manipulate the pins using a shell script or anything that can write to the virtual files corresponding to the GPIO pins. As a civilization, we are proficient with the “boil water, make steam” method of turning various heat sources into power we feed our infrastructure. Away from that, we can use solar panels. But what if direct sunlight is not available either? A team at MIT demonstrated how to extract power from daily temperature swings. Running on temperature difference between day and night is arguably a very indirect form of solar energy. It could work in shaded areas where solar panels would not. But lacking a time machine, or an equally improbable portal to the other side of the planet, how did they bring thermal gradient between day and night together? This team called their invention a “thermal resonator”: an assembly of materials tuned to work over a specific range of time and temperature. When successful, the device output temperature is out-of-phase with its input: cold in one section while the other is hot, and vice versa. Energy can then be harvested from the temperature differential via “conventional thermoelectrics”. Power output of the initial prototype is modest. Given a 10 degree Celsius daily swing in temperature, it could produce 1.3 milliwatt at maximum potential of 350 millivolt. While the Hackaday coin-cell challenge participants and other pioneers of low-power electronics could probably do something interesting, the rest of us will have to wait for thermal resonator designs to evolve and improve on its way out of the lab. How often do we find ourselves thankful for advertising? When it comes to Hackaday’s Retrotechtacular column it’s actually quite often since it snapshots a moment in culture and technology. Today’s offering is a shining example, where we get a great look into vehicular utility of the day that is rarely seen in our modern lives. The origin story of the Jeep is of course its prominence in World War II when more than half a million were produced. GIs who drove the vehicles constantly during the war greatly appreciated the reliability and versatility and wanted one for their own when returning home and a market rose up to satisfy that need. The modern equivalent would be the Hummer fad that started in the 1990’s. Humvee, the early ancestor of the Hummer, replaced the Jeep in the US military in the 1980’s and a version called Hummer entered the consumer market in ’92. But that was more of a comfort-meets-icon proposition, where the Jeep of the 1950’s (seen in the commercial below) delivered — even over delivered — on a promise of utility. In this ad, the case is made for Jeep as farm implement, acting as plow, mower, even post hole digger. As a firefighting implement the announcer boasts that “One man with a Jeep can do the work of 100 men with shovels” by cutting fire breaks into the soil. It’s sold as the workhorse of cemeteries, ranches, county service crews, and anything else their marketing gurus could write into copy. We think the metrics are dubious but certainly the inexpensive build, versatile nature, and need for power equipment across the countryside brought these Jeeps into widespread rural and industrial service in myriad roles. Power take off driving shaft to power circular saw. You can also see the hydraulics that lift and lower the saw. What makes most of this possible is the existence of a power take-off (PTO). This is a mechanical connection from the engine of the vehicle to external components that can be switched out. Once connected, the speed of the engine can be controlled to adjust the power take-off operation. In conjunction with a hydraulic system that can lift and lower the implement, it becomes a remarkably versatile system. We begin to wonder the American vernacular includes the saying “it’s like the Swiss Army knife of…” rather than calling everything that’s insanely useful a Jeep. Connect a pump to the PTO and you have a fire-fighting Jeep. Connect a generator and you can drive electric tools like the chainsaw used to cut down a tree in the video and to power an arc welder. There’s a gnarly-looking circular saw blade, and you’re going to spill your coffee when you get to the “Jeep-a-trench”. That’s right, a trenching attachment gives the vehicle’s suspension a rough workout. It boasts the ability to dig down six feet and complete the footings for an ordinary house in just three hours. Willy’s MB, the company behind the Jeep must have employed a crew of hackers. What a blast it would have been to be in the research and development sessions to come up with 1,001 more uses for the equipment. The company has a bit of Jeep history you can peruse, but we’d really love to hear about the addon equipment ideas that didn’t make the cut. Are there any readers who have some stories along these lines? Let us know in the comments below. Ah, the autorouter. Inside every PCB design tool, there’s a function called the ‘autorouter’. This function, when used correctly, is able to automagically lay traces between pads, producing a perfect board in under a minute. The trouble is, no one uses it. We have been told not to trust the autorouters and we hear a lot of other dire warnings about it. The autorouter never works. The autorouter will put traces everywhere. The autorouter doesn’t consider floorplanning, and sometimes you’re going to get traces that go right through the edge of your board. Is avoiding the autorouter sound advice? 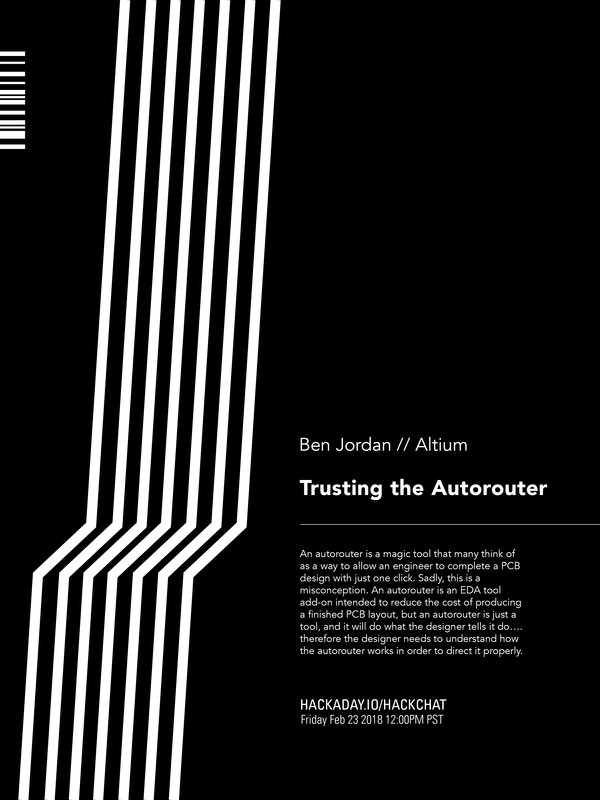 For this week’s Hack Chat, we’re talking about trusting the autorouter. The autorouter is just a tool, and like any tool, it will do exactly what you tell it. The problem, therefore, is being smart enough to use the autorouter. Our guest for this week’s Hack Chat is Ben Jordan, Director of Community Tools and Content at Altium. Ben is a Computer Systems engineer, with 25 years experience in board-level hardware and embedded systems design. He picked up a soldering iron at 8, and wrote some assembly at 12. He’s also an expert at using an autorouter successfully. In this Hack Chat, we’re going to talk to Ben about Altium, Circuit Maker, and how to get the best performance out of an autorouter. How do you set the autorouter up? How do you test your settings? What, actually, is the technology and math that goes into an autorouter? What is the best way to design a multilayer board? How do you do multiboard designs? And what’s the deal with mixed signals? Our Hack Chats are live community events on the Hackaday.io Hack Chat group messaging. This Hack Chat is going down Friday, February 23rd at noon, Pacific time. Want to know what time this is happening in your neck of the woods? Here, look at the neat time zone converter thingy.